Friday the 13th has so far been living up to it’s stigma. 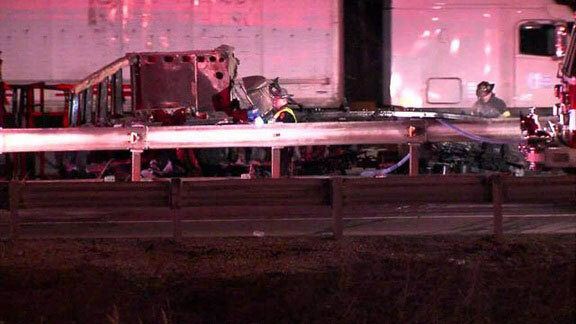 While details have yet to be released, the tragic trucking news came from Ohio early this morning when a semi-truck driver died after his rig went off the road on the Ohio Turnpike. Sergeant Bruce Zuchowski of the Ohio Highway Patrol said that for reasons unknown, the driver lost control of his rig and drove off the roadway while heading eastbound on the Interstate 80. At around the Interstate 480 exit ramp, he struck the guardrail and the semi-truck flipped over before bursting into flames. “For unknown reasons at this point in time, he drifted off the right side of the roadway. He struck the guard rail area which caused him to overturn,” confirmed Staff Lt. Jim Sivak, Assistant District Commander with the Ohio State Highway Patrol. The tragic crash occurred at about 3 a.m., and the Portage County Coroner pronounced the driver dead at the scene. Authorities say that more details about the accident will be released upon investigation and the truck driver’s identity will be released after his next-of-kin have been notified. While the truck was not carrying any hazardous materials, the accident shut down the eastbound lanes of the turnpike for more than four hours. Another major Friday the 13th accident in California also caused traffic to be backed up for more than 12 miles on the busy southbound 5 freeway after a FedEx big rig smashed through a concrete barrier and rolled onto its side. While the FedEx driver managed to walk away from the wreckage with only minor injuries, the cab and part of the big rig's trailer landed on the other side of the barrier where the freeway splits to the 170 Freeway. The accident was the result of a chain reaction that started in the Sun Valley area around 5 a.m. when a utility truck slammed into a stalled sport utility vehicle. 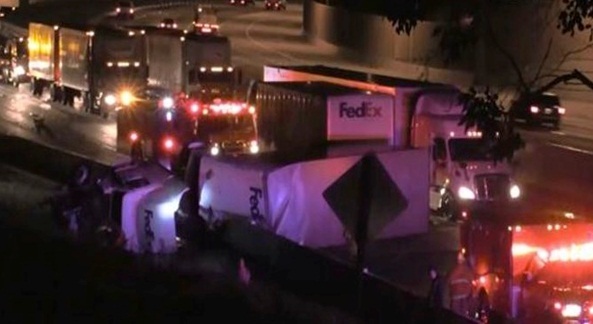 Two FedEx big rig drivers came along and both swerved to avoid the already crashed vehicles on the roadway, which caused one FedEx driver to crash through the concrete freeway barrier, according to the California Highway Patrol. The CHP had initially reported that two FedEx trucks were involved in the collision, but later confirmed that only one of the truck’s had crashed and the other was just on the scene. The accident also resulted in packages and fuel spilling onto the freeway, which meant closing the lanes until the cleanup and investigation is complete. I haven't seen any foreigners driving for fed ex but I avoid any fed ex trucks at all costs! I feel for the families, but I'm never suprised to here of a FedEx truck wreck..
Agree with the others..feel for the families but definitely not surprised to hear about another fedex crash. Mike Hodges you should take this in!